Ahhhhh, that moment when you pass the threshold from the modern world into the wilderness. It typically involves a few dirt roads and the loss of cell phone service (amen). There are often maps involved. It can also mean you’re near the vicinity of a trailhead, such as the one at Half Moon Campground. As expected, the trail head parking was a flurry of activity for the Fourth of July weekend. A handful of kayakers were heading up the canyon for some paddling. A middle aged couple was gearing up for a weekend in the back country with their dog and 6 year old daughter. We spoke with one sprightly local who had fallen into the creek, losing her expensive eye glasses. 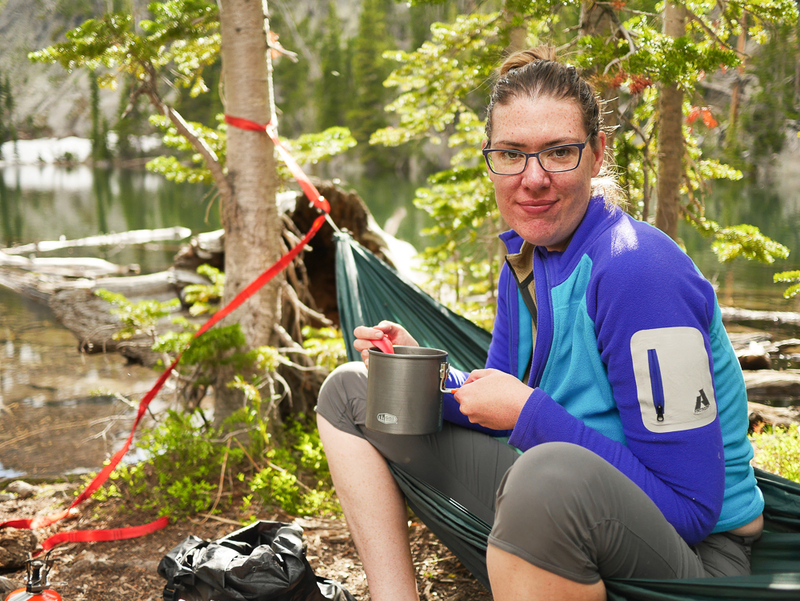 Despite her befuddled state she was gracious enough to offer a length of rope to hang our food once I discovered ours hadn’t been packed.. We also talked with a ranger, who casually mentioned of snow on the Blue Lake trail. Despite all the hubbub at the trail head, the back country would prove to be far less crowded. The hike to Blue Lake is officially listed at 4.5 miles. The hike is moderate to difficult, and worth of every step through the stunning mountain scenery. 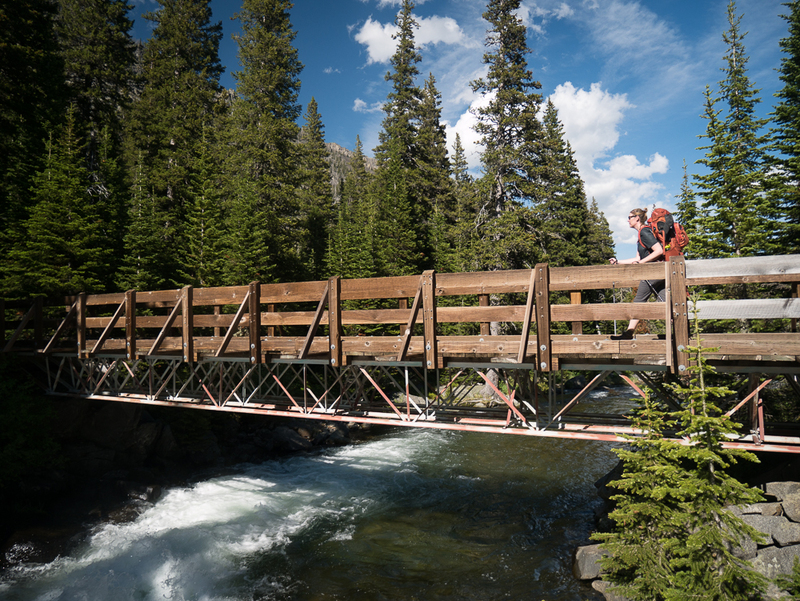 The first few miles of the trail rise steadily, crossing two modern footbridges. Following the second footbridge after a junction, the trail becomes markedly steeper. The steeper section begins with a brief stretch of switchbacks cut into a large rock slide area. 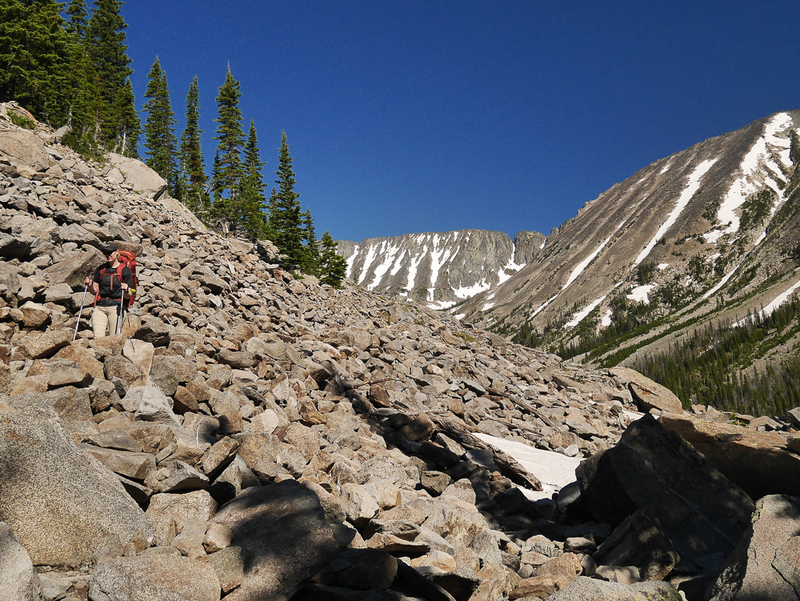 The boulder field is a habitat to a population of watchful and curious marmots, of which we saw a few. Following the switchbacks, the trails remains steep yet manageable as it rises through a heavily forested area before summiting a ridge above Blue Lake. As the ranger cautioned, the area had received some snow. By that, I assumed he meant a mere dusting. 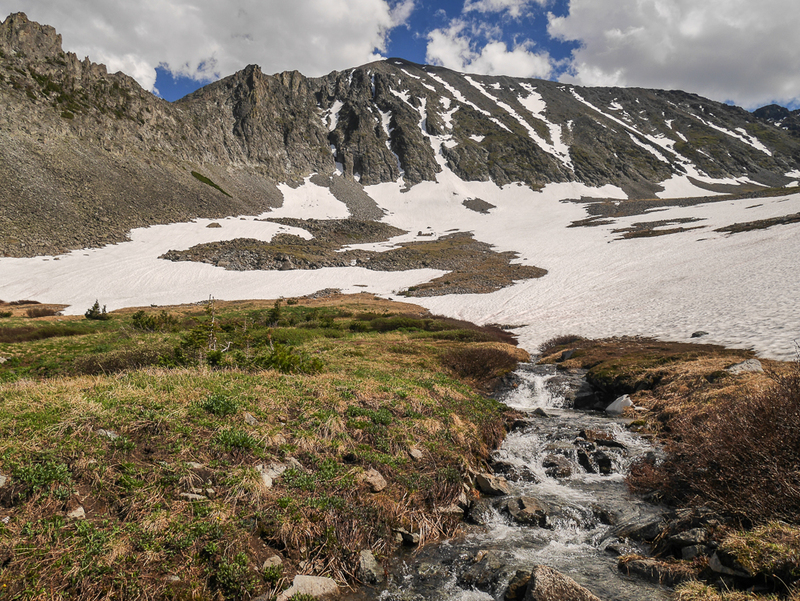 However, whether it was the recent snowfall or unmelted snow from winter, the entire upper stretch of the trail was covered in snow. We found ourselves spending the first day of “summer” vacation traversing a veritable snow field. 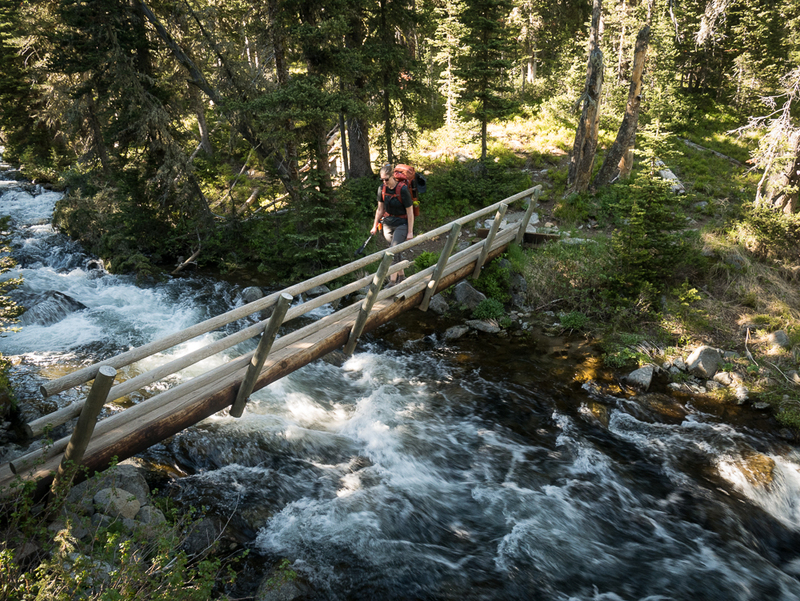 While it slowed down our progress, it added to the sense of adventure and further bolstered the fact that we were entering a true mountain wilderness. As an aside, despite the snow, the weather over the course of the weekend remained perfect with t-shirt weather during the day and 40-50 degrees overnight. The Blue Lake trail terminates at a stream which connects Blue Lake and Granite Lake. The entire hike took us about 3.5 hours on account of the snow. The area offers an abundance of scenery, opportunities for exploration, and a number of prime places to pitch a tent (disclaimer: Granite Lake is technically on private property and no camping is allowed). Along the shores of Blue Lake there are a number of obvious impacted campsites strung along the shore closest to the trailhead. There are also a number of campsites on a peninsula jutting into the lake, and more yet across the other side. We set up tent on a flat pitch of land adjacent to the steam connecting the two lakes. Closer to the water we strung up our Grand Trunk solo hammock and a REI Flexlite chair, two of the “luxury” items which I can justify at length carrying the extra weight. Sometime in the night a pretty raucous thunder and lightning storm rolled through the mountains. For those spending multiple days at Blue Lake, the area offers much to explore. 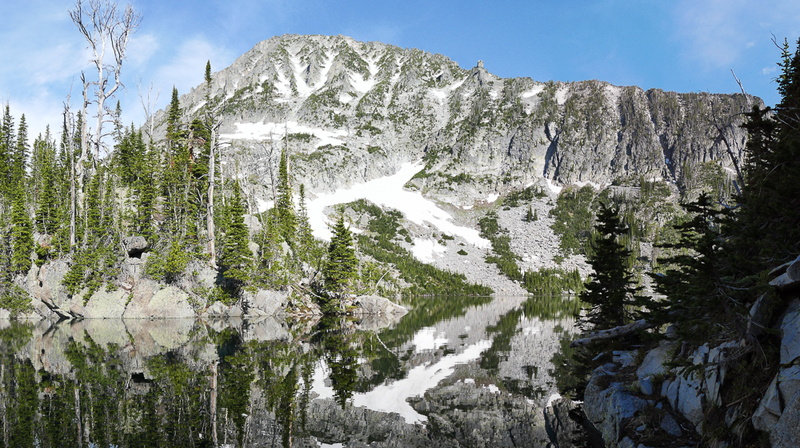 Aside from being a basecamp for more ambitious hikes up to Crazy Peak (elevation 11,214 ft), the lake is somewhat of a wilderness playground with its vast lake shore, log jams, and streams. A person could easily spend a whole day wandering around the area – which is exactly what I did. Returning to camp, I joined my wife by the campsite for some hammock time, followed by a dip in the lake. 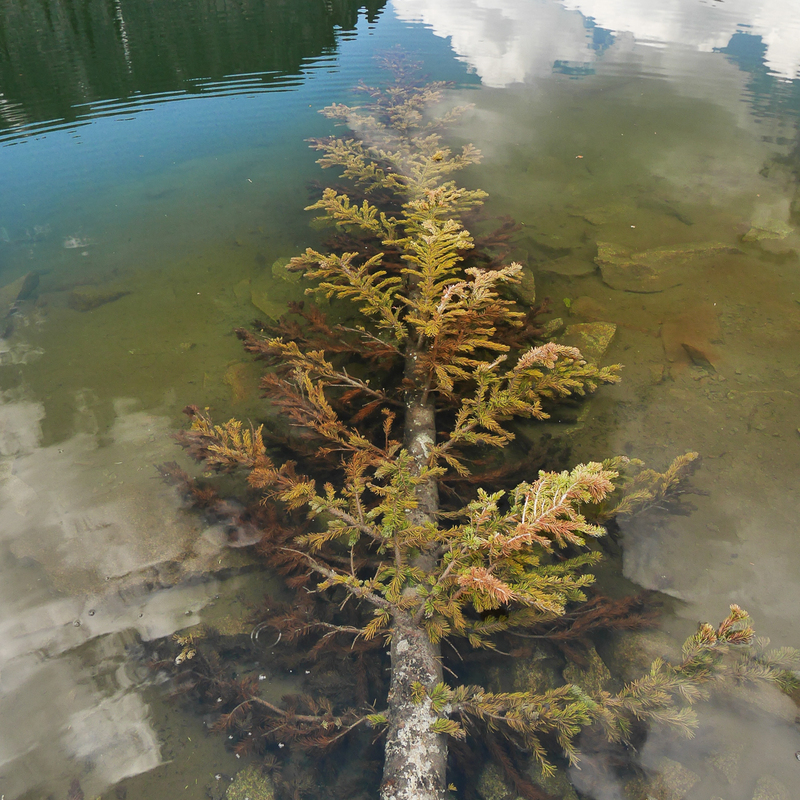 With snowmelt feeding directly into the lake, I was only able to stay submerged for about 20 seconds. For dinner, we enjoyed some Ramen noodles (which always taste 1000% better outside while camping) with a nightcap of whiskey from our lightweight plastic flask. We rose around sunrise, going straight for the coffee before hastily taking down camp and repacking our bags. We found ourselves back on the trail around 8:00am en route to Twin Lakes. Getting to Twin Lakes entails returning to the junction just below the second foot bridge and turning left. The trails are well marked and anyone properly prepared with a topo map should have no navigation problems between these lakes. From the junction the trail rises moderately on its way to the first of the Twin Lakes. Mile for mile, I can’t imagine a better payoff for a person’s efforts. Emerging from the tree cover, the view opens up to the mouth of the massive lake reflecting the saw-toothed ridges beyond. 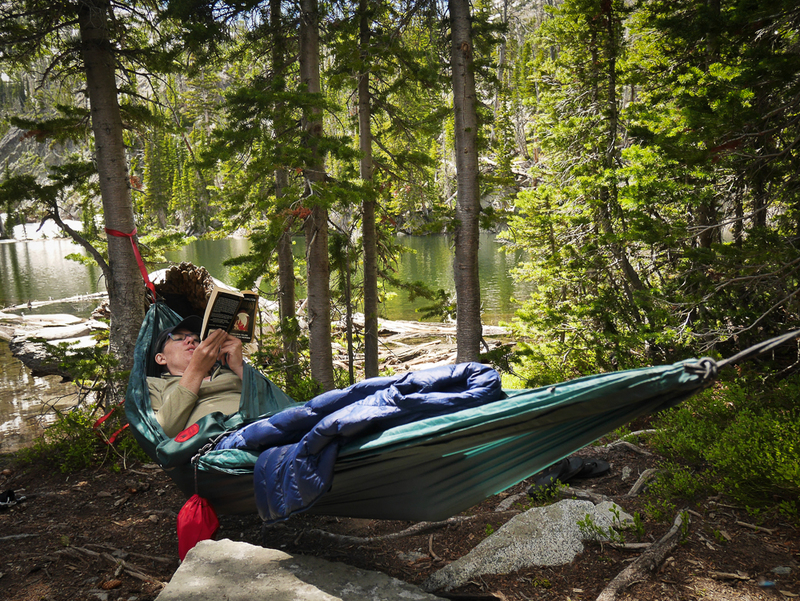 In every backpacking trip there’s that one defining moment that encapsulates the whole journey. It may be a sunset, a particular vantage point, or the sound of a rushing creak. For me, it was this first glimpse of lower Twin Lake, which is . For several moments before selecting a camp, we stood at the mouth of the lake, stupefied by the view in front of us. Along the lake, a gently sloping shoreline edged by trees offers ample camping. A few prime spots can be found amid tree clusters directly bordering the water. We chose a nice sunny spot with a great view of the lake. We spent the first part of the day relaxing, having lunch, and napping. The latter part of the day we hiked up the half mile or so to the upper Twin Lake. 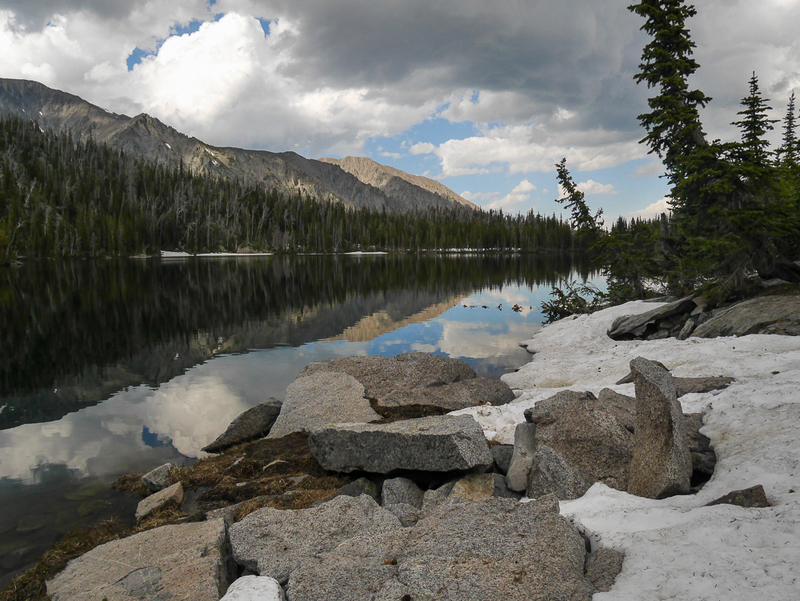 Upper Twin Lakes is just as beautiful as the lower, but offers what appears to be fewer campsites. It’s also the gateway into further exploration of the Crazies. We awoke predawn to pack up, but to also take pictures of the sunrise. I ambled around in the predawn light trying to find a perfect shot. With the mountains facing the east I had high hopes for a sunrise spectacular. When the sun finally crested the horizon it illuminated the mountain with a pure bright light. The light also cut through the clear lake water, revealing the polished rock beds below the surface. No sooner had the sun crested then I stripped to my underwear and waded about 50 feet across the lake to a large boulder to secure a vantage for a photograph. 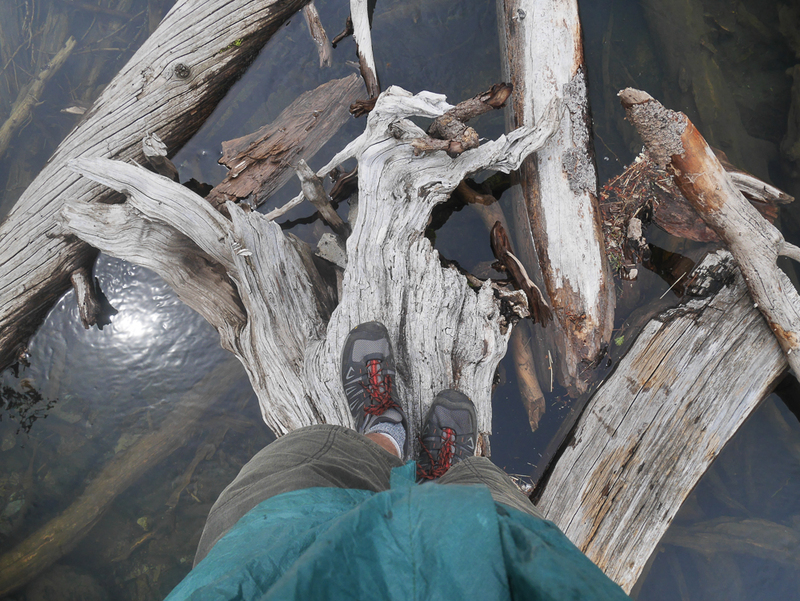 The depth of the water reached about mid thigh, and was so frigid that I barely was able to pull myself onto the outcropping before my lower extremities lost all feeling. The better shot turned out to be back on the other shore, but the freezing water shocked me wide awake. 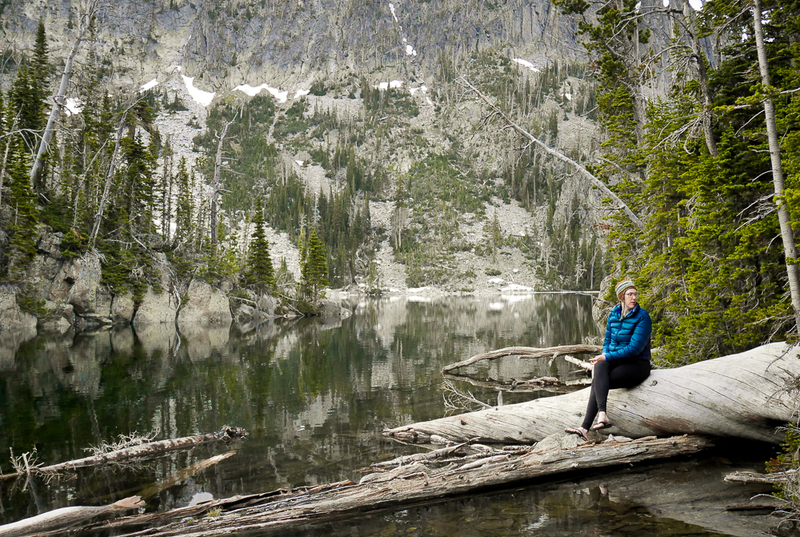 We packed up camp, filtered a few bottles of water, and took one last look at the beautiful scenery before ambling the 4 miles back to the car, discussing what kind of “real” food we were going to eat once we got to Bozeman on our way to the Tetons. One member sighed and said, “I always hate going back in.” I couldn’t agree more. PLANNING A TRIP TO THE CRAZIES? DID YOU FIND THIS ARTICLE HELPFUL? PLEASE COMMMENT BELOW. Beautiful shots Mike! you need to get with a publisher you are so very talented! Biking 2000 miles in 2019.